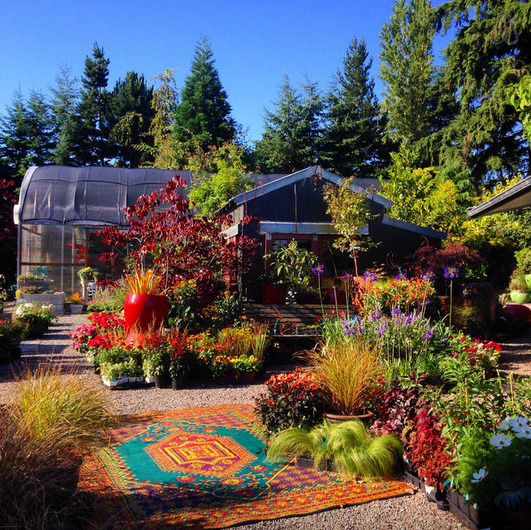 DIG Nursery lies at the heart of Vashon Island, a perfect day trip from Seattle, Tacoma, or the Olympic Peninsula. We offer an expansive greenhouse brimming with succulents and a fantastic selection of air plants and unusually awesome plants perfectly suited to the Pacific Northwest, as well as gobsmacking containers and gifts for gardeners with a modern design sensibility. We also offer garden design and build services. And you can even stay at the DIG Guest Suite, Plant Heaven! To get to DIG from the Ferry Terminal at the north end of Vashon, drive south on Vashon Hwy SW (the main road) for 5.6 mi, and turn east (left) at 19028 Vashon Hwy SW. To get to DIG from the Ferry Terminal at the south end of Vashon (Tahlequah), take an immediate left as you get off the dock and then drive north on Vashon Hwy SW (the main road) for 8.1 mi, and turn east (right) at 19028 Vashon Hwy SW.
Ferries run regularly from Seattle (Fauntleroy – North Vashon schedule), the Olympic Penninsula (Southworth – North Vashon) and Tacoma (Ft. Defiance – Tahlequah schedule) and generally take about 15 minutes. See the ferry schedule. Fares are only charged en route to Vashon – the return trip is free. Vashon has regular bus service 118 & 119 that comes from the ferry right to DIG! Note that there is no weekend bus service.